Welcome to my site! Thanks so much for stopping by! If you are looking for all natural self-care products, you have found them! My company, WOD Balm has been around since 2013, just a few months after I graduated nursing school (Go UA Wildcats!). I have loved making all natural salves and balms for many years, and I always wanted to do it more. Finally I decided to follow my dream! All the salves and balms and bath bombs you find on sale here in my store were made by hand by me! I'm not just a salve maker, I'm also a crossfitter, a nurse, and a boxowner (this is what they call people who own crossfit gyms). New Self Care Kits for Autumn! SELF CARE - Everybody could stand to do more of it. If you work out hard, chances are you're behind on your self care. If I were a betting woman, I'd bet You or Someone You Know, are a couple of people who could use some more Self Care. containing all natural Bath Bombs, pumice, and other WOD Balm produts! Beautiful and ready to go for the holiday season. Have you got a crossfitter on your list? What are you getting for your coach this year? Consider getting the athletes on your list these handmade all natural self care sets. These Self Care Kits are nice to look at and they contain delicious smelling, all natural, magnesium (good for sore muscles) containing bath bombs! All kits also contain all natural pumice stones from Mt. Shasta, California. Recyclable and reusable attractive packaging. Have you tried Tear Repair? If not, you've been missing out! 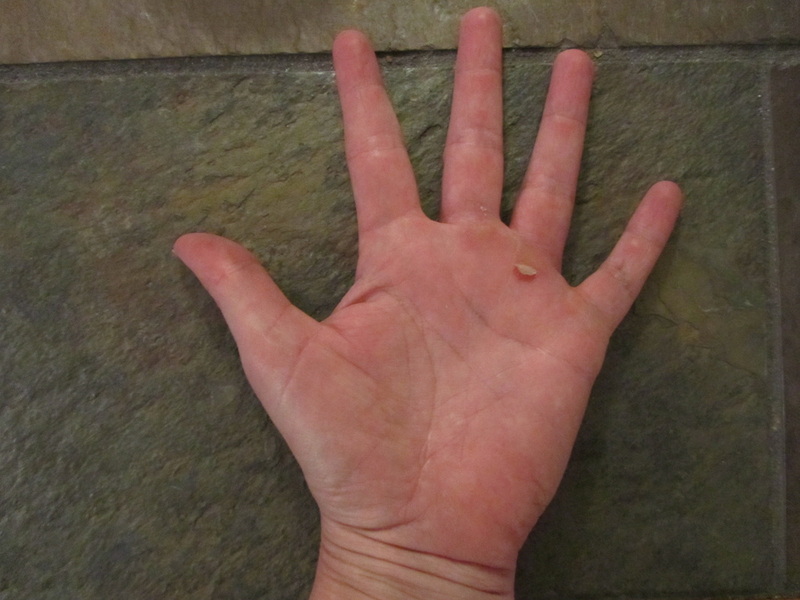 Tear Repair is an amazing all natural balm that Heals Hand Tears FAST!! Check out the photos below taken by Carly, an actual Tear Repair user. 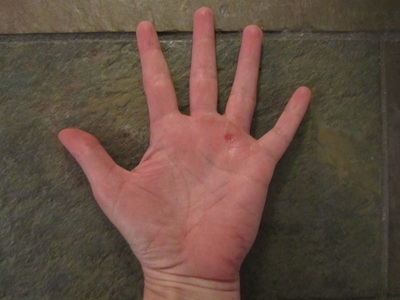 Carly tore her hand doing hella pull-ups during a workout at our gym, Wildcat CrossFit, in Tucson, AZ. Note the flap of skin near her ring finger! Ouch! Carly applied Tear Repair several times per day on Day 0 and Day 1. By Day 2 the skin flap had long since torn off and the tender skin underneath had dried out and hardened, the open wound had closed and healing was well underway. Watch the dramatic healing take place before your eyes (in the pictures below). Though not fully healed, by Day 2 Carly's hand was healed up enough for her to do more pull-ups without pain!! Do you rip your hands often? Keep a tube of tear repair in your pocket. Have a gymnast, a rower, or a crossfitter in your life? They will thank you for turning them on to Tear Repair! 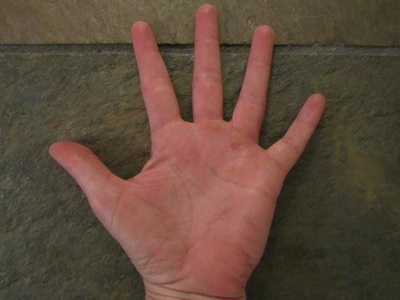 Day 0 - Immediately after tearing. WOD Balm Fizzing Bath Bombs (two varieties currently available are: Peppermint/Eucalyptus and Lavender) are specially formulated to relax sore muscles by flushing out the lactic acid built up through exercise. ​Tear Repair heals new tattoos fast! 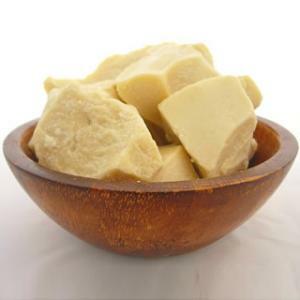 All Natural soothing ingredients nourish skin and speed the healing process. Heal without itching or scabbing. Also, Tear Repair is Not Gooey! This is a big plus! Tear Repair also heals cracked skin, cuts, hand tears, abrasions, and minor burns. WOD Balm is a line of 100% all natural body care products that naturally heal, sooth sore muscles, torn skin and dry lips. Hi I'm Jen. I founded my company, WOD Balm, LLC, nearly four years ago. 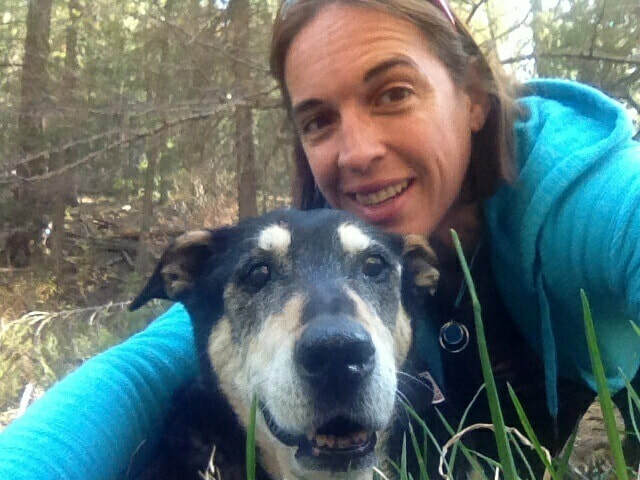 I am a Registered Nurse with a Masters Degree in Nursing, who has also studied Western Herbalism and Natural Medicine for over 15 years. I also co-own Wildcat CrossFit, a Fitness Community where we promote a natural lifestyle replete with Functional Exercise and a Natural Diet. I've been crossfitting since 2009. I love it and and I credit the sport with helping me to get into the best shape of my life, learn to channel my intensity, and also with helping me access strength I never knew I possessed. So when I was trying to think of a name for my line of Intense Herbal Salves, WOD Balm just sounded right. If you don't get it, don't worry. Just know from now on that WOD Balm = Powerful, Effective, All Natural Healing. I am committed to creating an all natural product line. All WOD Balm products are All Natural, seriously, check our ingredient label. And it's Effective, which means it works. WOD Balm products solve problems. WOD Balm Muscle Relief Salve - Relieves Pain in muscles and joints and repairs strained or sprained muscle tissue. In addition to use after exercising, try Muscle Relief for sore joints and chronic arthritis pain. Tear Repair - Is an awesome and effective First Aid salve. Tear Repair works on contact relieving pain, healing small burns, cracked skin, torn hands, cuts, scrapes, and new tattoos. Great for gymnasts, rowers, gardeners, ...and people who do a lot of pull-ups. If you care what you put on your skin and if you want some all natural products that really work, look no further. You Found Us. Nourish Your Body Naturally ... From the Outside In. WOD Balm Muscle Relief - soothes sore muscles and relieves pain on contact. This powerful combination of herbs and essential oils speeds circulation to wherever it is applied, warming and cooling the affected area. Available in 1/3oz, 1oz, 2oz and 4oz sizes. Tear Repair - soothe and pamper rough, callused, torn-up hands, aid healing of minor wounds and abrasions, and even help heal fresh tattoos! Available in .15oz and .35oz sizes. Lip Balm - soothes and softens lips. These lip balms contains all natural ingredients that conditions our lips, protects them, and heals cracks. SPF 6. Available in Original or Mint. If you've ever done CrossFit, or if you have friends who do, you know that CrossFitters have their own language. I'm told it sounds strange to lay-people when they hear a bunch of CrossFitters talking, but to me it just sounds like people talking. That being said, "WOD" is CrossFit lingo for "Workout Of the Day." That's cool. 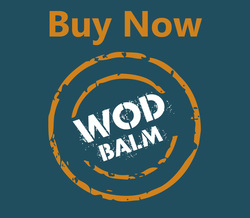 WOD Balm isn't just for CrossFitters. 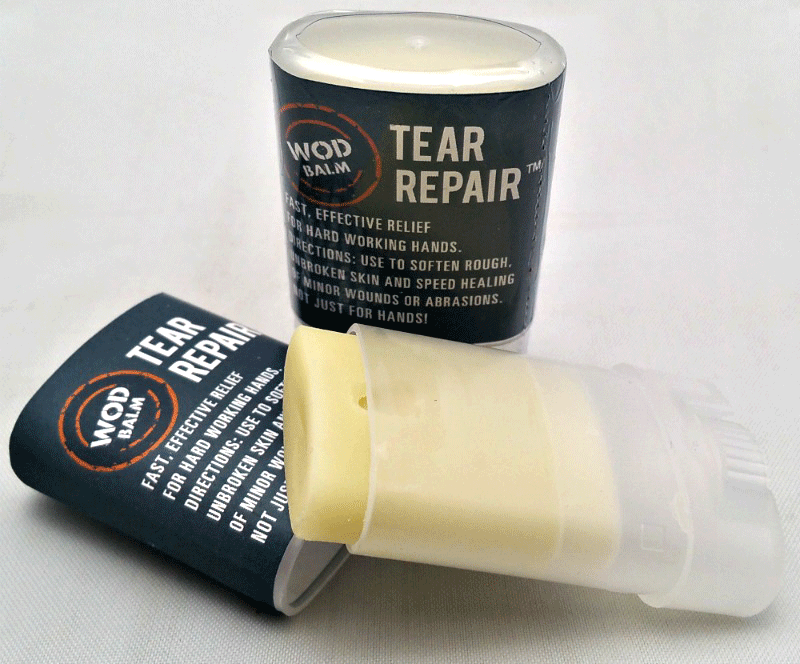 If your sport leaves you hella sore, WOD Balm is for you. No matter what sport you do, if it leaves you sore and aching, give WOD Balm's Muscle Relief Salve a try! in a wide glide-on tube. Effective, all natural healing power for torn skin. "My hands were both bleeding from pull ups and toes-to-bar. I used Tear Repair and by day 2 I felt like I could do more pull ups." - Jessica D.
My skin seemed to crack all the time in the winter, until I found Tear Repair. Now even the stubborn cracks in my heels and elbows are healing. And the split skin on my fingers is gone!" - Jo A. Subscribe To Our Monthly Newsletter for Specials and great info!